OH MY GOD IT'S THE BOOK FAIR!!! When I was in middle school, the highlight of my year was the annual book fair. Living in a town of less than 5,000 people, we had no bookstore, and no place that sold books. Our library was fairly decent for a small town, but its selections barely seemed to turn over, and it never felt like my library. Since I lived in the country, we had to make a special trip in town for books and spend $25 on a library card just to rent from there. Our school library was even smaller, and though I liked the librarians and once in a while would find a book that interested me, it was obvious money was not being spent on that area of the school. Everything seemed to predate the 70s. Needless to say, as far as books go, the scene was a little depressing. But the book fair was one bright wonderful time a year when all hell broke loose and the book-starved masses were let loose upon the school. Honestly, I don’t know how I would’ve lasted without it. I think I missed sleep some nights thinking about all the books coming to town, and how I couldn’t wait to caress those shiny new covers glistening like so many rainbow gems. It was the one time of the year where the world came to us in its little book caravan. Suddenly, we weren’t marooned in the desolation of Central Illinois–those books were the key to our escape. I bought all of my favorite books at the book fair, which consisted of several metal shelves rolled into our school library. They were filled with mostly young adult fiction titles, from the latest Newbery winners to the newest editions of favorite children’s classics; across the board, most had been printed within the last three years, a far cry from the selection we were used to seeing. 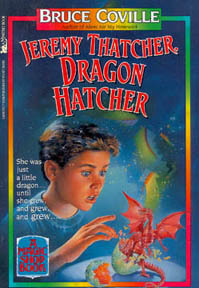 Most of my most formative books were bought at the book fair–my childhood favorite, Jeremy Thatcher, Dragon Hatcher, and Patricia C. Wrede’s Enchanted Forest Chronicles were the gold standard everything else would have to live up to. I can’t imagine where I’d be today without my school book fairs. Every book I ever owned as an adolescent (4th-8th grade) was either bought at the book fair, or could be linked back to a title I bought there. It’s the jumping off point to my storytelling future, where I first learned to really love books. I drove past an elementary school today and saw a sign posted on the curb that read BOOK FAIR. Instantly, my instincts lit up with excitement and my whole nervous system leapt like a live wire. Yes, a part of me wanted to wheel around and drive into the school just to see the books, even though I now live in a town with a Barnes and Noble and a nice used bookstore. Some old habits never die. But this is one habit that actually made me better for it, so I think I’ll keep it. 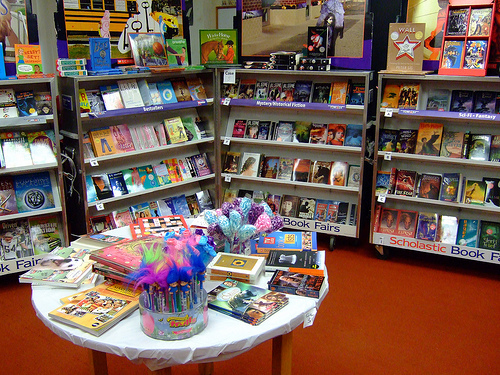 Do you have any memories of the book fair coming to your school? What were some of the titles you discovered there?